NARA M1674. 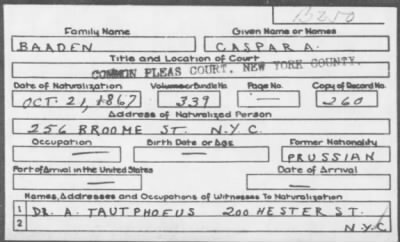 The Soundex index to naturalization petitions filed in federal, state, and local courts in New York City, including New York, Kings, Queens and Richmond counties, 1792-1906. COMMON PLEAS COURT, NEW YORK COUNTY. This publication contains index cards for petitions filed in New York City courts between 1792 and 1906. Browse by year, then alphabetically by last name of petitioner. In the upper right-hand corner is the Soundex code, the first letter of the surname followed by three digits. Read the full description for Soundex instructions.